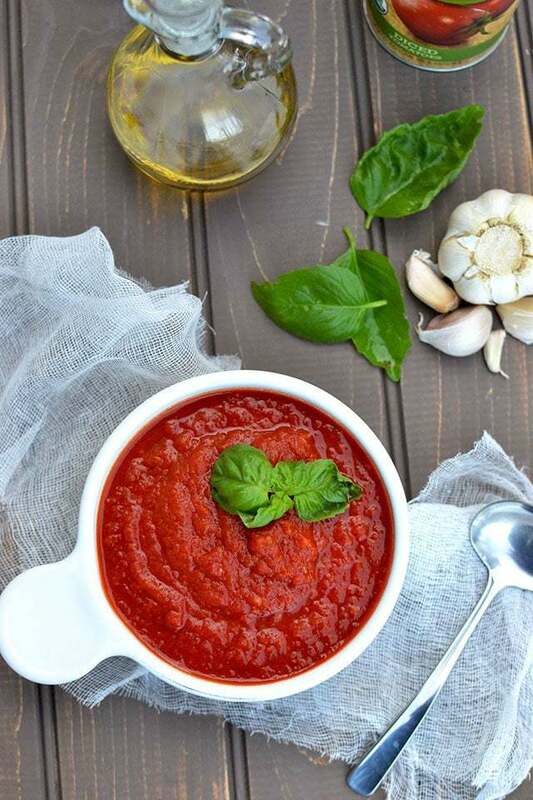 Marinara Sauce made with just 3 ingredients. All this recipe needs is canned tomato, garlic cloves, basil and 15~20 minutes of cook time. It has a beautiful red color and is subtly flavored with the garlic and basil. Serve it with pasta, as pizza sauce or as dipping sauce. If using whole or diced tomatoes, blend them until smooth. In a deep, wide pan; heat the oil and garlic. Once the garlic starts to sizzle, slowly add the tomatoes. Cook uncovered on medium flame, stirring occasionally, until the sauce thickens about 15~20 minutes. Serve with pasta and enjoy! !